Get a Grip! 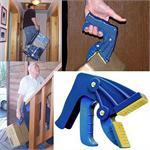 Click on picture to see uses.LiftMate box gripper allows you to grip and carry cardboard boxes weighing up to 40 lbs. with ONLY ONE HAND. Great for repetitive loading and unloading. Used in shipping and receiving departments. Use yourself at home... use one hand to hold stair railing and one with a LiftMate to grab the box. Use the LiftMate the next time you help a friend move.